There are a variety of therapies to provide heat and cold therapy to the body that helps to reduce swelling and pain and facilitates rehabilitation. Pumping Cooler Systems: Includes a cooler to hold ice and water with an electrical pump that pushes the water through a tube to a pad. 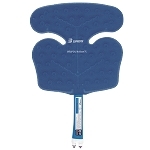 The large reservoir of water in the cooler allow the system to maintain a temperature in the pad for significantly longer than other hot/cold therapies for long-term and post-surgical recovery. Gravity Cooler Systems: Includes a cooler to hold ice and water with a tube to a pad. You raise and lower the cooler every 20-30 mins to allow new cooled water to flow into the pad for therapy. 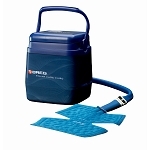 Hot/Cold Packs: Gel packs that allow you to freeze or heat them for hot or cold therapy. These are more versatile than individual packs, but may not offer the same type or length of therapy. Heat Packs: Packs of gel or beads that can be heated and applied to the body for the benefits of heat. Cold Packs: Packs of gel or beads that can be frozen and then applied to the body for the benefits of cold on the body.